This Monday you are in for a treat. Not only did Maria snag this inspo pic from the least likely of locations for us (her CPAs office), you can take us up on a huge offer to put today’s inspo into action action by taking us up on an offer to test drive a free week trial with VFit, this week (click here to redeem your week)! Now, onto the weekly goods……….an inspirational blog to fill your tank this Monday. As you go about your days, how do you view the world? Do you even notice anymore that there is a world going on around you, or is your head down, eyes glued to your smartphone too much? Sadly, this is the norm these days. Look up the next time you are in line at the coffee shop and we are willing to bet, that 90%+ of the people in line are glued to their phones, and not engaging with one another. Engagement is what makes humans the most productive and special species on this planet, yet we are losing all touch with it. There is more depression than ever before, more health issues, anxiety, obesity, and on and on. Everyone is so busy searching the big never ending web of resources out there, and we are forgetting to do the simple things each day to show up and CREATE our best selves. At the hands of technology, we are losing a lot of what we are built to grow from, and that is human connection. Maybe I live in a bubble, but this blew my mind the other day when I found this out. You can order a Starbucks from your phone, walk in the shop, pick it up, and never have to say a word to another human in the process. But VFit is NOT a tech company by any means! We utilize a few simple pieces of technology that were already out there and are using those systems to deliver that human connection to our team. It is one of our core values to facilitate an environment where our team can show up and work hard, to create a better version of themselves each and every day! 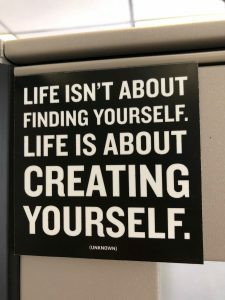 While doing a mundane task of getting her taxes done, Maria looked around and saw this quote that fit OUR group and mindset so much, that she had to snap a pic and use it for this week’s inspo! And if you’ve been faithfully reading these posts over the last few months, you likely have picked up the common theme of taking ownership over your health and personal wellness. You find yourself by running around like a chicken with it’s head cut off, telling yourself that life is going to slow down and soon you’ll get to do all the things you have planned for YOU. You CREATE yourself by showing up in some capacity each and every day, doing something to fill YOUR tank! Whether it is exercise, meditation, gardening, reading or mixing between things your love – you do something almost daily that fills YOUR heart and soul. Too often, women can let themselves take the back seat to life. The ultimate caregivers, where the needs of everyone else comes ahead of our own. And yet, when you do this, what do you have left to give? Probably not much. And most likely what you are giving is only a small percentage of what you truly want to give, and with less than ideal energy or enthusiasm to give it. Instead of enjoying all that you have going on in your busy life, each thing feels like a chore because YOU are depleted. You are letting your own gas tank run on empty day in and day out. You have the power in your own life to create a life full of health, wellness, and abundance. Never before have we lived in a time where many issues of society is an issue of TOO MUCH. We have too many clothes, our kids have too many toys, too much stimulation, we have too much food in our fridge we can’t find anything. We have too many activities to do for the kids, that we are running around like maniacs. We simply have too much. Too much is great, but if you spread yourself too thin, then you are trying to be everywhere at the same time. Doing this really leaves you overextended and not truly giving your all to any one area and giving less than optimal effort. // You can create your own fitness program by picking through our jam packed schedule and log in from home, creating extra time for yourself by saving the time it takes to the gym. // You can create more positivity in your life by surrounding yourself with an incredible, supportive, and engaging community, where you lift one another up each and every day! // You can literally create more oxygen for your body and give yourself MORE LIFE, by boosting your fitness level and working your heart and lungs to go beyond just survival mode, but into one where they flourish and gain strength. Taking the time to create lasting healthy habits will give you more for your life and the lives of those around you. Once you start challenging and pushing yourself on a regular basis with exercise, your comfort zone will expand and will do MORE in your life and be less afraid. Your confidence will grow with each victory. Our team is here to actually cheer you on – BY NAME! – with each one too! When’s the last time someone honestly cheered you on? Where they could SEE your effort, your sweat, your form? This brings us full circle to the start of this blog, in that with our platform, you are getting that actually human connection you need! If you have tried every program under the sun and don’t know why you can’t stick to it, let us tell you – working out alone is no fun! Not many can succeed that way, so it’s not you! When you log in to class, your VFit trainer greets you with a smile and two way interaction. Yet what really sets us apart from other ‘online fitness’ platforms, is SHE IS WATCHING EVERYONE TAKE THE CLASS! Yes, she’s watching your squats, if it looks like you need a boost to keep going, she’ll give you an uplifting personal shout out! Or if someone seems to need another option for a move, she’ll give it. We are live. Real trainers. Honest support. And one heck of an amazing community. Last but not least we are here to help you create your best life! The VFit trainer team is here 364 days a year to help support and cheer you on, as you work towards your best self in 2019, inside and out! We can’t get your dressed and logged in, but we will keep doing everything else in our power to keep you motivated, enjoying your fitness and honoring this amazing body you have that deserves to move and be challenged! And if you are looking for nutrition help, we have set up a nutritional supplement program, VFit Squad, with membership options, including nutrition coaching, that will help you dial in this important area of you health. 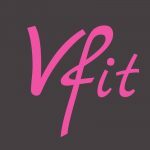 Vfit has really help me in so many ways! I love the inspiration from each of the instructors and each other! Since I am traveling in Italy for 3 weeks it has kept me stronger and these quotes are great! Life is definitely precious and I’m working on living it to the fullest! I’ve missed being able to take live classes due to the 9 hr time difference but YANGO keeps me going!